Authorities say that the woman could not have survived the night. File photo of a P&O cruise ship. THE SEARCH FOR a woman who went missing after falling overboard a cruise ship off the coast of Australia has been called off. 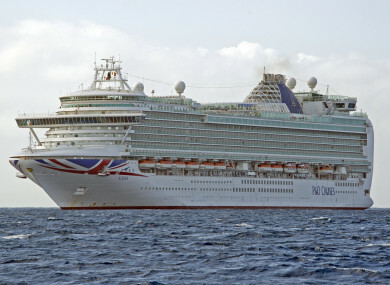 The 47-year-old Brisbane native fell from P&O Cruise’s Pacific Dawn ship off the West Coast of Australia around 4pm local time, 6am Irish time, yesterday. The Australian Maritime Safety Authority (AMSA) said the search was terminated the following morning, ABC News reports. A spokeswoman said doctors believed she would not have survived past 5am local time in the conditions. In a statement, P&O said it had searched throughout the night and into the morning without success. “It is with a very heavy heart that I need to let you know that we have been unable to locate our guest,” the captain of the Dawn Pacific told passengers on Friday morning, according to the Guardian’s Australian edition. The woman is understood to have been on the ship with family, and is believed to have been feeling unwell before the incident. Intital investigations indicated that the woman went overboard 150 nautical miles – almost 300 kilometres – from New Caledonia, the Queensland Police said in a statement. No suspicious circumstances were identified at the time. Email “Search called off for woman who fell from cruise ship off the coast of Australia”. Feedback on “Search called off for woman who fell from cruise ship off the coast of Australia”.